60% Google Pixel Slate review: is this high-end tablet a winner? Despite a gorgeous design, relatively nippy performance and a truly lovely keyboard, there are too many little irritations about the Google Pixel Slate to recommend - especially given it's so expensive. So yes, the Pixel Slate can replace your laptop if you buy a keyboard. But you need to spend nearly £1,000/$1,000 on those two things to get a set up fast enough for you not to go mad with frustration - and with that you still get an annoying tablet experience and a laptop that isn’t fun to actually use on your lap if you get the Google keyboard. But, if you are a Chrome OS user and you want the most versatile, well-built Chrome OS device ever made, the Pixel Slate is your device. If not, hold tight. There will be more like it…I guarantee it. A Chromebook is a great way to get a £200 computer that can handle all the basics, and save you from a potentially deeply disappointing Windows machine at that price. But in its current wobbly and hollow state Chrome OS just doesn’t deserve this kind of flashy treatment. But while I probably wouldn’t recommend the Pixel Slate to anyone looking for a full-time tablet or Chromebook, I also wouldn’t talk someone out of buying one. For all of the annoyances, I enjoyed using the Pixel Slate, and it’s definitely one of Google’s best-designed products. I’ll certainly keep using and report back as things improve. But for now, if you have $1,000 to spend on a Chromebook, you’re probably better off getting the year-old Pixelbook. The Pixel Slate proves that a great keyboard and trackpad and a great browser make a difference, and they're the missing links that the iPad Pro desperately needs. But the Pixel Slate doesn't feel like it's good enough at everything else for its high price. No. The average person would do better to buy an iPad and a laptop separately. Right now, it’s only the right purchase for someone deep in the Chrome OS ecosystem who’s looking for a device that can do it all. If you really need a Chromebook, options from other manufacturers provide similar experiences without the large price tag. qWhile the Google Pixel Slate starts at $599 -- with an Intel Celeron CPU, 4GB of RAM and 32GB of storage -- we tested the $999 configuration that rocks an Intel Core i5 processor, 8GB of RAM and 128GB of storage. On top of that, you'll want the $199 Pixel Slate Keyboard and those who prefer to write longhand and draw should check out the $99 Pixelbook Pen. The Google Pixel Slate is a great 2-in-1 with small issues that Google needs to fix. Like with the iPad Pro, too often I ran into frustrations that the Pixel Slate threw into my path, and sent me scurrying back to my regular laptop. And the cold reality is that the App Store has more to suit Apple’s tablet than the Play store has for Google’s. Factor in that the Pixel Slate – with expensive and pretty much essential keyboard attached – is thicker than the Pixelbook, not to mention the annoyances of trying to perch it on my lap, and I think I’d still go for the far more affordable convertible notebook not its new tablet sibling. The Google Pixel Slate is better than just about any Android tablet when it comes to productivity. Naturally that depends on what you’re going to be asking it to do, but within the web environment, you’re getting a very powerful browser from Chrome and a great keyboard (sold separately). The Pixel Slate is another Google Halo device. It's the Chrome tablet for people to see just how great a Chrome tablet can be, and for other manufacturers to reference while building their own Chrome tablet. And at that, it's a masterpiece. Being extremely well built, having a great display, and advancements in the user experience department make it a success where it counts. Google almost certainly knows it won't sell millions upon millions of Pixel Slates, but it can also take a few moments and enjoy the fact that every goal was accomplished and the Pixel Slate is an amazing product where it counts. 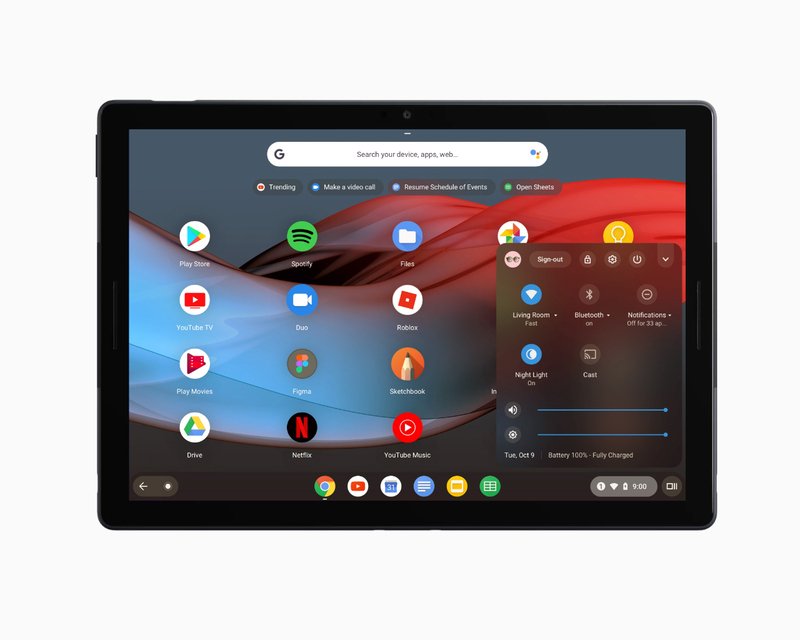 zThe Pixel Slate is a perplexing mobile productivity device, combining the design and appeal of a flagship 2-in-1 tablet with the starting specs of the cheapest Chromebook. Will it rise to the top of 2-in-1 tablets? Only a full review will tell. The Pixel Slate starts at US$599 for the model with 4GB RAM, 32GB storage, and an Intel 8th-generation Celeron CPU. A total of five SKUs are available, with the most expensive US$1,599 model sporting 16GB RAM, 256GB SSD, and an Intel 8th Gen Core i7. The Pixel Slate keyboard costs US$199, and the Pixelbook Pen costs US$99. The Slate will be available later this year on the Google Store in the US and in major retailers in the US, Canada, and the UK. The Pixel Slate is a beautiful looking Chrome OS convertible that has the chops to be a fantastic travel companion, student laptop replacement and mobile workstation for basic office busywork. The Pixel Slate arrives later this year. We'll have a full review when we get a model to use for longer than a quick demo session. But at this price, the Pixel Slate has a big question mark hanging over it: who would buy this over a Microsoft Surface or an iPad. The Pixel Slate is a perplexing mobile productivity device, combining the design and appeal of a flagship 2-in-1 tablet with the starting specs of the cheapest Chromebook. Will it rise to the top of 2-in-1 tablets? Only a full review will tell. Google Pixel Slate initial review: Can Google take on the iPad Pro? Overall, the Google Pixel Slate looks premium, feels great to use, and with the keyboard dock added it functions very well. The Google Pixel Slate comes in four prices and configurations. The base model of the Pixel Slate starts at $599 which gets you an Intel Celeron processor 4 or 8GB of RAM and 32 or 64GB of storage, respectively. The highest end model costs $1,599 and comes with an 8th Gen Intel Core i7 processor, 16GB of RAM and 256GB of storage. These prices don’t include the $199 Slate Keyboard or the $99 Pixelbook — you’ll have to buy them separate. Even the base model’s price can add up very quickly. Without at least one of these accessories, you won’t get the most out of the Pixel Slate. Positive: Good price; decent hardware; nice performance; decent display. 70.44%: This rating is bad. Most notebooks are better rated. This is not a recommendation for purchase.